Bugs and Fishes by Lupin: LOTS of Felt Christmas Decorations! To kick off December, I thought it'd be fun to share a photo of my mum's felt Christmas ornament collection... all lovingly sewn by me, of course! 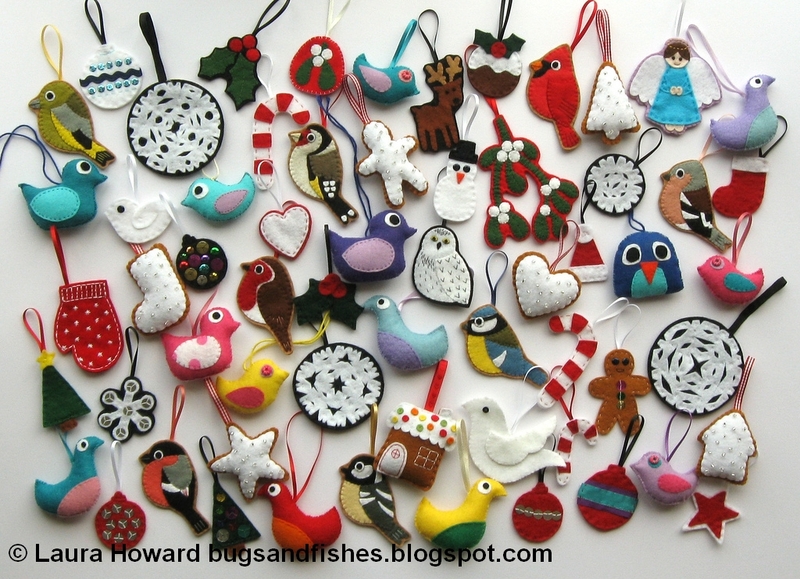 ... and some of them are from free Christmas ornament tutorials I've shared here on this blog, including the angel ornament, the snowflakes, the star and heart, the simple baubles, the candy canes, and the Christmas pudding. My mum's collection also includes the prototypes I stitched when designing the Christmas tree ornaments and the snowmen. I love this collection. I decorate my tree only with handmade items. One of your books has just landed here it was supposed to be for christmas but I talked hubby into letting me have it now as I NEEEEEED it! Lovely, lovely, lovely! I have a question for you. I have a copy of your Felt Book and wonder what your policy is on making things from the book to sell. Is this okay, or is it for own use/gifts only. The red and orange bird in the bottom raw is my favourite! Anonymous - Thanks for asking! All the projects from Super-Cute Felt are intended for personal use only, so you can make them for yourself or as gifts for friends but please don't sell them. The same goes for all my projects in other books, like Fa La La La Felt and any free projects I share here on my blog. Gorgeous! I have a bag of felt lying around and I want to make some Xmas decs with Twiglet, I think these will definitely inspire me. If he doesn't want to sew, I'll get the glue out !! What a beautiful and special collection! You could decorate an entire tree just with these :). Hi I love the picture of all the decorations you've made for your mum, particularly the birds in natural colours. Have you got tutorials on any of them as I would love to make a mobile for my workroom,(yup just for me!) I love me some burdies!!!!!!!!!! Lynda - I'm afraid I don't have a pattern for the British birds as they're a product I make & sell in my shops. Sorry!